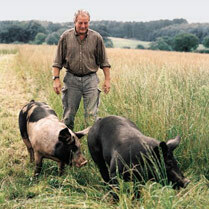 The pork for Waitrose sausages comes from British farms, and from pigs that are outdoor bred. All Waitrose sausages are made from succulent British pork. The pork we use to make all our sausages comes from the same dedicated and exclusive farms as our fresh pork. Essential Waitrose sausages are great quality at a great price. The pork used for the sausages comes from outdoor-bred British pigs. We use prime cuts of pork and trim (the meat we cut off joints to get them a specific size) in our essential sausages. There’s no rind, offal or mechanically recovered meat in any Waitrose sausage or pork mince – and there never has been. 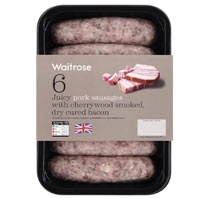 Essential Waitrose sausages are sold pre-packed and include pork sausages, pork chipolatas and cocktail sausages. Look out for our speciality sausages, sold pre-packed in black trays. They’re made from British outdoor bred pork shoulder and belly. Flavours range from the Gourmet to Toulouse or Chorizo or with added ingredients such as apple or sweet chilli and onion. These are prepared using pork from our free-range British-reared pigs sired by Hampshire boars, using only selected cuts of shoulder and belly. The Hampshire Breed is a traditional breed, and its meat is known for its tenderness and flavour. The pork is coarsely chopped and mixed with spices to make tasty, succulent sausages, which are sold either pre-packed or on the meat counter. The pork in our delicious Duchy from Waitrose sausages comes from our 4 farms in Yorkshire and Norfolk, where the pigs are fed an organic diet and allowed to roam freely on land farmed to organic standards. The farms are regularly monitored by the relevant organic accreditation bodies. If you’re after something a bit different, try one of our fantastic Heston from Waitrose sausages. Made with outdoor bred British pork, they take the humble banger to a new taste sensation level. Flavours include a Spicy Goan Choris Sausage and an Ultimate Smoky Sausage. Roger Newton is one of the farmers who supplies pork for our free range sausages, from his Norfolk herd of Hampshire Breed pigs. "Rearing the pigs outside with lots of space to forage means the meat becomes very flavoursome."